The rush from cashing my first paycheck after college made me feel like I was rich. The rush from cashing my first paycheck after college made me feel like I was rich. In reality, being rich or poor is relative. My definition of being rich meant I no longer had to worry about paying my monthly utility bills. I falsely believed I would finally live my dream life on Easy Street. Money initially brought me happiness after I had been a starving student for so many years. The love of fashion has always been a weakness of mine. After getting on my feet financially, I splurged on myself and purchased a new handbag. Initially, I had an endorphin high from shopping. Unfortunately, over time, that beautiful handbag was no longer new or pristine. My knee-jerk reaction was to go buy something else to feel that same high, or what I thought was happiness. Deep down in my soul, I was less content than I'd ever been, trying to use stuff to fill a void in my heart. The problem with this strategy was that stuff always broke, rusted, went out of style or lost its luster. The trappings of this world also became meaningless when I faced real trials. I felt discouraged, thinking I’d finally be happy when I was able to support myself financially. The world had fooled me. It turned out that money did buy temporary happiness; it just didn't buy lasting JOY. The Scriptures teach us this truth in 1 Timothy 6:9-10: “People who long to be rich fall into temptation and are trapped by many foolish and harmful desires that plunge them into ruin and destruction. For the love of money is the root of all kinds of evil. And some people, craving money, have wandered from the true faith and pierced themselves with many sorrows.” If you spend your days longing to be rich, you’ll be tempted and trapped by your own harmful desires. “The love of money” is evil. Not money itself. Money is a tool used to bless people and provide basic human needs. What's evil is when our heart desires money above all else. As time marched on, I began to experience health issues. A physician recommended surgery to solve my chronic sinusitis, just one of the health challenges I faced at that time. My life hadn’t turned out to be the fairy tale my professors had promised in business school. After having sinus surgery, I spent two weeks recovering at home. My first day back in the office was extremely stressful. I found myself buried in piles of paperwork and demands I couldn’t meet. I cupped my head in my hands and sighed with disgust as tears rolled down my cheeks. Unexpectedly, my nose also began to bleed and flow down my face alongside my tears. Eventually, blood began hemorrhaging from my nose, and I slowly lost consciousness. No amount of stuff or money could save my life. We learned later that an artery had been accidentally severed during my sinus surgery. After emergency surgery to stop the bleeding in my nose, I needed a blood transfusion. I was teetering on the brink of death. How had my life ended up this way? I was supposed to be the kid with tons of potential, a great education and a promising career. Here’s what I learned: When we fail to learn lessons in an easy manner, God, in His mercy, will strip everything away until He gets our attention. It took this trauma to awaken me to what values are truly important to God. He values our hearts and a relationship with us, above all else. He wants us to spend time daily studying Scripture, serving others and in prayer and fellowship with other believers; He does not want us shopping for stuff to make us feel better. My career as a financial advisor now gives me a platform to teach individuals how to manage money well and deliver the gospel simultaneously. How we handle our money often represents our heart. Money and stuff are not inherently bad. We just can't use them as a substitute for Jesus. True security and lasting joy can only come from a relationship with Jesus. Dear Lord, You are the only source of true and lasting JOY. Help me learn to manage money in such a way that it doesn’t manage me. In Jesus’ Name, Amen. For more on what it means to manage money faithfully, grab a copy of Emily G. Stroud’s new book, Faithful Finance: 10 Steps to Move from Fearful Insecurity to Confident Control. Connect with Emily at emilygstroud.com. She’s giving away a FREE budget worksheet to help you take the first step towards achieving financial freedom. 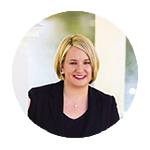 For daily financial tips and encouragement, find Emily on Facebook here: Emily G. Stroud, MBA, CFA. What are you tempted to use as a substitute for Jesus in your life? © 2018 by Emily G. Stroud. All rights reserved.